IT'S SCARY TIME! ! It's Halloween month! It's an exciting time! Share the excitement! 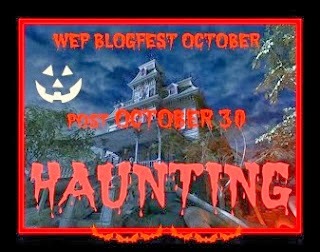 Write...Edit...Publish invites you to sign up for HAUNTING OCTOBER! You can scare us, make us laugh, make us cry...your choice. PLEASE JOIN US! WRITE a story, fiction or non-fiction, a poem, find some scary photos -- (you could write your story in pics!) OR any form you like -- your choice! SPREAD THE WORD -- the more the scarier! POST on October 30th -- a little before or after is okay. MAKE sure you add your Word Count, your copyright and whether you want no/full critique. LEAVE A COMMENT IN THE LINKY POST OR IN THE CBOX IN THE RIGHT SIDEBAR. TELL US YOU'VE POSTED! READ as many entries as you can. This is a SUPPORTIVE bloghop. POST to Google+, Twitter, FB or any other social media if you like the entry you read. Don't forget to follow each other!! SPECIAL ANNOUNCEMENT! There will be a PRIZE of a $10 Amazon Gift Card for the entry of Denise's choice. She will be looking for the most creative, most riveting, most eye-popping entry to receive this award. Or simply the entry that impresses her most. The tugging on her skirt became more urgent. Janna gave in and stopped what she was doing and gave Charlie her full attention. The image of a ragamuffin ten year old child, cheeky grin lighting up his face, a misty aura glowing about his head and body. Charlie loved it when she acknowledged him. He was so lonely without his family. Janna put her hands on her hips, tilted her head and raised her eyebrows at him. Be careful driving today, miss. I’m always careful, Charlie. You know I take care on the roads. I have a feeling miss. OK Charlie, you win, I’ll be very careful driving. Janna tried to keep the sarcasm out of her voice. She thought back to a year or so ago, when she first became aware of Charlie. Her girlfriend had persuaded her to attend a Spiritualist Meeting; she’d said it would be fun to see people acting stupidly. Sarah came away laughing at everybody; Janna came away with a strange feeling. The medium had ‘come’ to her during the clairvoyance part of the service and had told her that she had a spirit with her. Yeah right, she thought cynically. Me. Me, who doesn't even believe in God, has a spirit with me. Please, pull the other leg; it’s got bells on it. They’d gone to the pub for a drink afterwards, a Saturday evening, only nine o’clock, it was far too early to go home. Sarah downed her white wine while deriding everything from the meeting, usually Janna’s cynicism matched Sarah’s but this evening Janna was troubled. Driving carefully to the supermarket Janna kept her eyes peeled and her concentration high. Those lights were on green but should she slow down just in case they turned red? Oh Charlie, sometimes you do play with my mind. She managed to navigate through the supermarket aisles with no incidents or mishaps. As she loaded the groceries in to the boot of the car she noticed one of the bags had a stain on it. ‘Oh that’s just great,’ she exclaimed to herself. A dozen eggs had managed to crack and leak all over everything. She heard a childish giggle. Shaking her head gently Janna drove home just as cautiously. She didn't know how she lived with Charlie. He was a lost soul, a lovable, mischievous child. Janna finished unpacking the groceries, cleaned up the mess from the broken eggs, just as her parents arrived for their weekly visit. She heated milk ready for the coffee while they waited for the kettle to boil. She turned to speak to her mum and saw Charlie just about to touch her mum’s head. ‘Charlie!’ she admonished under her breath. ‘What did you say, darling?’ asked her mother. ‘Coffee is nearly ready,’ she replied quickly, frowning and shaking her head at Charlie. Her mum brushed her hand on her hair, smoothed a curl back in to place, picked up the tray and took it through to the living room. Charlie bounded in front of her, nearly tripping her up, laughing and giggling all the time. ‘Behave Charlie,’ Janna thought she whispered. ‘Oh you’re not doing that mumbo jumbo stuff again, are you Janna? You know you really are too old to have an imaginary friend.’ Her mum was always critical of everything she did or believed. Her dad looked at her strangely, Janna was sure he gave her a wink behind his wife’s back. Janna didn't hear or see Charlie for the rest of the day. There was no rhyme or reason to his appearances and disappearances and she had to admit she missed him when he was gone. He was a little scamp at times, hiding things, moving things for days on ends, even playing with the lights but knowing it was Charlie she wasn’t frightened any more. Her husband, Doug, returned from work. They talked about their days while they ate supper. Janna told Doug about Charlie messing about this morning. She was aware of Charlie’s presence as she spoke about him. Then Charlie did something he had never done before. He kissed her on her cheek; Janna’s hand flew up to her face tracing the gossamer touch. She watched him transfer his attention and affection to Doug sitting opposite her. Charlie sat down next to Doug and started rubbing his shoulder. ‘What’s the matter?’ Doug asked her. Doug raised his eyebrows, a forkful of food halfway to his mouth. His hand jerked and he dropped the fork. ‘He wants to play with you.’ Janna wasn't sure how Doug would take this news. He was such a straightforward, pragmatic bloke and although he had believed her when she told him tales of Charlie he didn't believe in ghosts and spirits or things from the netherworld. Charlie brushed his hand over Doug’s bald head and passed his hands across Doug’s face. Doug brushed his face and shuddered slightly. ‘Charlie is doing that.’ Janna could still see Charlie. She felt sad, she knew it was probably the last contact she would have with the lovable little imp. ‘I can't see him.’ Doug shrugged it off. Charlie peeked over Doug’s head, winked at Janna and disappeared. Great story telling. Chilling and spine-tingling! Oh, a haunting of the creepiest kind. Do not like children as ghosts, the spookiest! I'm watching PBS Things that Go Bump in the Night and they're talking about Lucy, a young ghost, who's mother searches for her constantly, to this day. Awful! My own dreams with ghosts of children, frighten me more than any other! Hi Sally. Charlie is both playful and creepy. He appears to be having more fun than anyone else! A well-thought-out story which ticks all the boxes for me. I think you should write some more about Charlie. Hopefully see you on Nov 22 for SHARING!! Oh lovely, Sally. Sad and funny, and Charlie is such a cute little soul! Would make for a wonderful kids novella. Her attitude towards being haunted by a ghost child is so... resigned. A very interesting take on haunting, Sally. What a strange story. It took me a while to understand that Charlie was a child-ghost. I have mixed feelings about this. Your text is beautiful. You are such a gifted writer, that you can write about subject that other writers would make a mess of. You get it right. You write it in a way that makes it work. But, for me, there is just something too sad about the idea of a ghost who is a child. I don't like photographs of babies with angels wings either. Thank you for visiting and commenting on my story about insomnia. It means a lot to me that you like my story. I have added some photos that you may want to look at if you have the time. This is such a lovely, well written story. It is sad, but perhaps not that sad... perhaps this poor ragamuffin has finally found a family in Janna and Doug... I would really love to read more about them. Charlie is mischievous. I hope Doug is okay. Well written and a fun read. Sally, this is sweet and sad all at the same time. I kept expecting something bad to happen, but it didn't. I felt her sadness that Charlie had moved on to Doug. This was really sweet but left me feeling a bit sorry for Janna. It seems more like a coming of age story for a ghost, Charlie needing a male presence in his life. I really liked it! Interesting perspective. Thanks for reading my entry the other day! Sorry it took me so long to stop by! That's a cute story and a fun read. Well written.